This Feberge Pendant has a flower on blue background with Cubic Zirkonia around it.This Pendant features great piece of art.This makes it a great wedding gift. A perfect gift for someone very special. 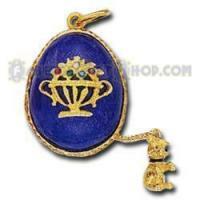 Exquisite, sterling silver, 14-karat gold plated (1.5 mkm) fashion jewelry Faberge eggs (worn as pendants), crafted by hand in the style invented by Carl Faberg?, jeweler to Russian Tsars! 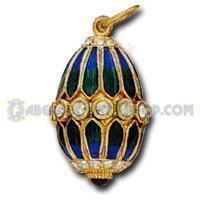 Hand-enameled by skilled jewelers, these shining eggs capture the splendor and glamour of the Imperial family. The design variance is truly impressive - classical, baroque, renaissance, modern. 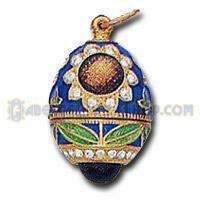 The depth and richness of enamel colors is stunning. 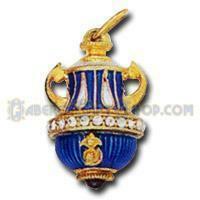 Perfect as a pendant or charm. 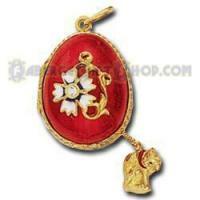 If you are looking for a gift or souvenir, these beautiful pendants with gem stones are a perfect idea. 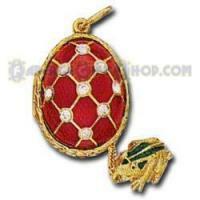 Whether you need a present for him or present for her, Valentine gift or Christmas present, Easter or Communion present, Anniversary, birthday or wedding present - these Faberge style pendants will do it. 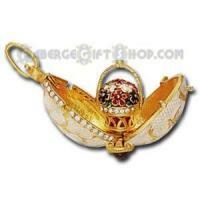 Presented in a golden gift box. 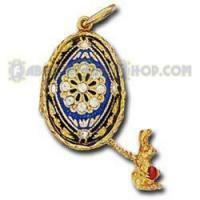 These charming beatiful pieces of fashion jewelry are made entirely by hand, and therefore with no two exactly the same. Colors may vary slightly. 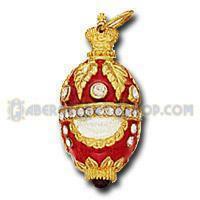 are made exclusively for Russian Treasure and are not available from anywhere else. 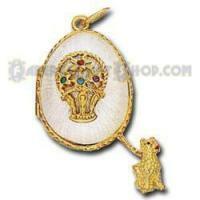 Shop at Russian Treasure with confidence!